Before installing bolt assembly, check to see that the ring gaps are staggered to prevent loss of gas pressure. 1. 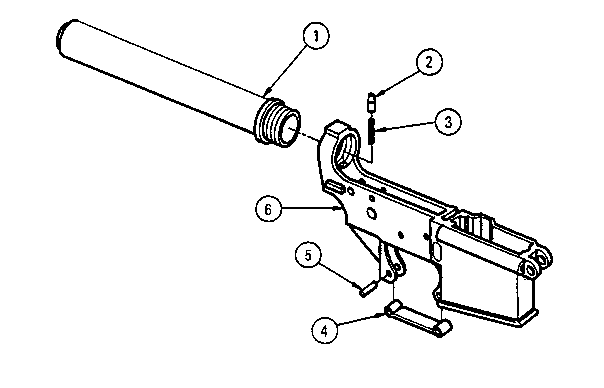 Install bolt assembly (1) into key and bolt carrier assembly (2). 2. Install bolt cam pin (3) and rotate 1/4 turn to secure bolt assembly ( 1). 3. Hold key and bolt carrier assembly (2) with bolt assembly ( 1 ) down and drop in firing pin (4). 4. Install firing pin retaining pin (5) from left side only to ensure proper installation. Check for proper installation by attempting to shake out firing pin.